Thanks for stopping by for today's Play Date Cafe Challenge. If you follow along with the PDCC, Julie asks the Designers a question each month, so you get better acquainted with the Designers and this week is my turn to answer Julie's question - Where do you Create? I'll be sharing my creative space further down in this post, so be sure to scroll down. This week Julie issued the DT a wonderful "Splash of Color" challenge. These are always fun, I'm looking forward to seeing how everyone (YOU included) interprets the challenge. This weeks color "splash" is Blue, the prize is being sponsored by Limelight Papercrafts. I used the Up and Over Technique from the June TJNL along with the beautiful Winter Queen Anne's Lace (BG-147-0) from Fred B. Mullett. I added some butterflies from the Beautiful Wings Embosslit, leaving space at the top to add a sentiment later on. This card would make a great All Occasion card, but I think it would also be perfect for a Sympathy card. As I mentioned, I cleaned up my studio to show you what it looks like, when my family came home, both the boys said "boy you have so much room on your counter now, why'd you clean?" My DH asked if a storm came through my room. Actually it did storm when I took the photos, that's why they appear so dark. The last two photos are of my studio later that night, as I had some work to do. 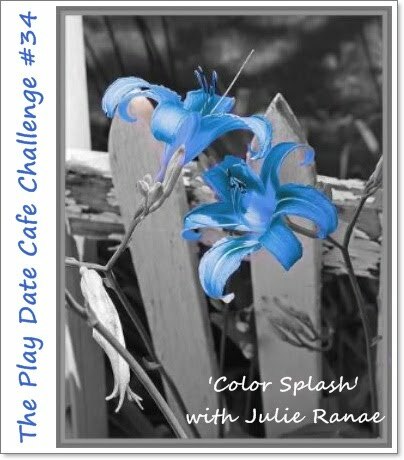 Here's this weeks Color Story Photo, we'd love for you to play along with this weeks challenge at The Play Date Cafe, you can find all the details here on how to enter. If you upload to any online gallery please use keyword PDCC#34 so we can find your creations! Thanks for the wonderful inspiration of a color splash, too! very nice - love the card. Great peak at your craft room. I'm lucky to have a small path to walk in mine, and as soon as I make space to work, it seems to shrink. I love the blue in your card. Thanks for sharing. Beautiful card. I agree that it would make a great sympathy card. Your storage space is awesome. You lucky lady! TFS. Gorgeous, Lisa! 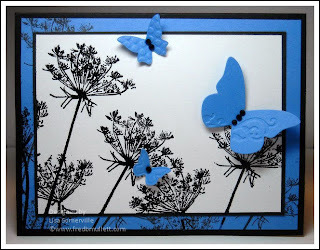 Wonderful images and love the bright blue butterflies! Loved the peek into your studio, too.. what a great space!! Perfect for a Sympathy card, which are always so difficult to create. Thanks for the visit in your studio! Wish I had cabinets! I love your studio--love that second desk for me! And I love those pics of your studio "after" you were creating! AHHHHH--LOVE IT! 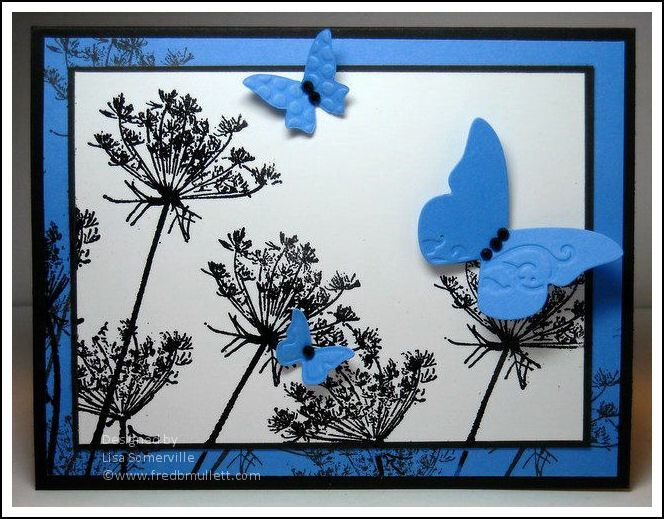 I also am super excited about this card--those flower stamps are super gorgeous:) I love butterflies too! Two good combos:) And the third would be PDCC:) LOVE IT! I love the color of blue you used, gorgeous card!! Just fabulous! what fun to get a peek at your studio! Love the video of your crafty space! TFS :) Your card is lovely! I like how you embossed the wing of the butterfly! Fab card! Love the technique you've used. LOVE this card! THX for the tip about leaving space for the sentiment - too smart for ME to figure out on my own!!! THX for the pics of your space! !